The best way to see and appreciate the dramatic Pembrokeshire coast and all the wildlife the inhabit the waters and cliffs around Pembrokeshire, is by boat. There are several excursions available; from exhilarating jet boats, to more sedate evening cruisers, there is certainly something to appeal to everyone. Please read below for some of the more popular operators and the trips they provide. 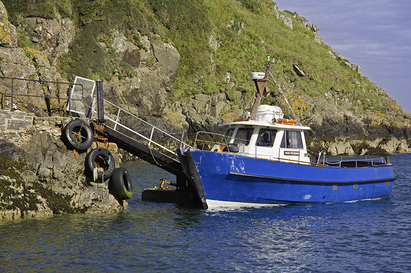 Voyages of Discovery are a long established boat trip operator, situated in St Davids . 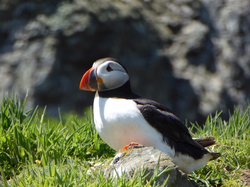 Land on Skomer Island - spend the day exploring the beautiful island nature reserve and see the thousands of Puffins, Guillemots, and Razorbills, along with a host of other birds and wildlife. Gentle cruises through the surrounding waters and bays of Skomer, or further offshore to Grassholm Island and it's incredible Gannet colony. Or discover the wildlife and history of the Cleddau Estuary and Milford Haven Waterway on one of our haven trips. A great option for those not so keen on the movement of the open ocean. A unique experience: the only boat company to offer the fun and excitement of the New Zealand jet boats with the best of Pembrokeshire’s wildlife, uniquely able to explore Ramsey’s challenging caves and coves, no propellers to injure wildlife. The boat is one of a kind: aluminium hull, extra large tubes, designed around the New Zealand jet which powers it: tough enough to cope with anything, highly maneuverable, able to navigate safely into areas inaccessible to other boats, awesome fun! 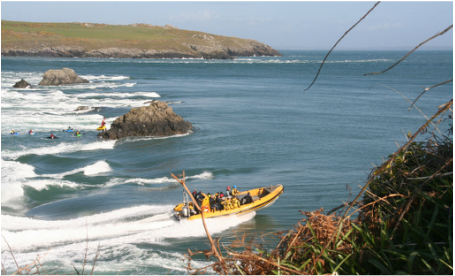 With over 25 years’ experience, no-one has more experience working RIBs off the St Davids coast than they do. They don’t just own the business: they’re out on the water with their passengers, skippering every trip themselves, sharing their passion for the sea, the wildlife and of course the fun of jet boats! Two hour trip from Dale. Ideal for the novice and less experienced angler. 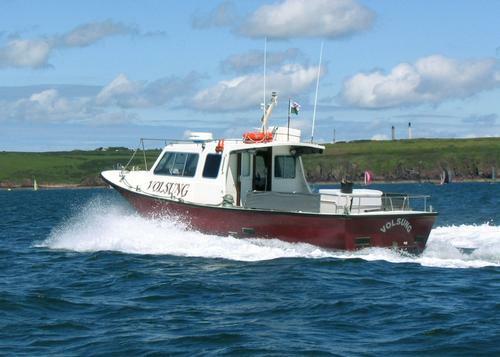 This is a popular trip within the sheltered reaches of the Milford Haven waterway and off St Ann's Head for mackerel, pollack and the occasional cod or wrasse. Available May to August. £12.50 per adult and £10 per child under 16. Four hour trip from Dale. Also suitable for the less experienced as well as more advanced anglers, this is a slightly more adventurous trip. We generally head to Skokholm and Skomer Islands in search of more and larger fish, drifting over reefs. You may also get to see the spectacular sea birds and mammals that have made these islands so well known. Available April to September. £25 per adult and £20 per child under 16. 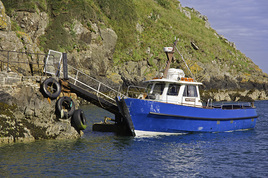 Departing from Lower town Fishguard, Razorbill sea safaris offer an exciting and informative guided wildlife boat trip. 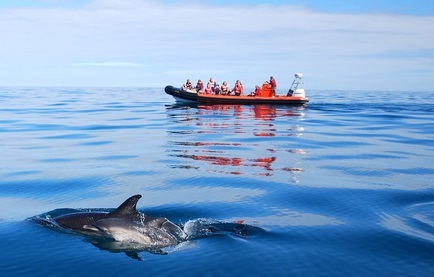 Their ulta - maneuverable RIB, will take you to see the breathtaking North Pembrokeshire coast and wildlife (including dolphins, porpoises, seals and sea birds). Their SeaSafari wildlife watching trips are suitable for the whole family. 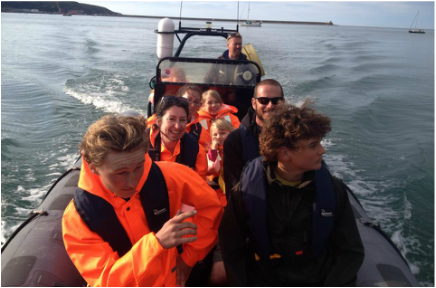 Whilst the RIB enables us to transit rapidly between sites, manoeuvre swiftly and access areas where other vessels might struggle, they do stress that the focus for SeaSafari is the amazing Pembrokeshire coastline and wildlife…. rather than an out and out thrill ride. 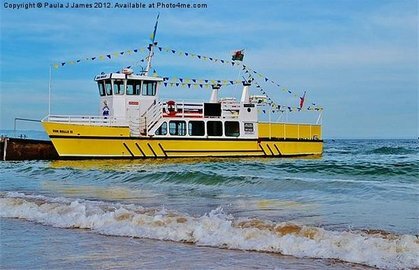 Their standard SeaSafari trip is 1 hour long and can take up to a maximum of 10 passengers, and will run with a minimum of 6. All necessary safety gear is provided (as well as a full and detailed safety briefing). Offering boat trips around Ramsey, Skomer and Grassholm Islands. Discover a magical island wilderness coupled with the fun and excitement of a true marine adventure. Witness some of the most powerful currents in Britain, pass beneath some of the highest sea cliffs in Wales, see spectacular breeding colonies of hundreds of nesting seabirds. Ramsey is home to one of the UK's largest Atlantic Grey Seal colonies, hundreds of seal pups are born on Ramsey beaches from late August to October. There is a good chance of seeing the Harbour Porpoise in Ramsey Sound. Venture offshore to see the gannets on Grassholm Island, over 39,000 pairs of breeding gannets, search offshore for whales and dolphins or take a trip over to Skomer Island to watch the Puffins. For further details on the numerous trips they do please see their website. 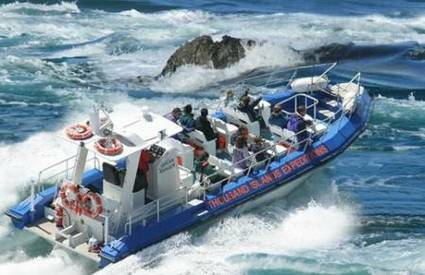 Seal Safari - Licensed to carry 23 passengers on comfortable inboard seats, Seal Safari is suitable for all ages. We leave Tenby Harbour daily on one hour cruises to explore the hidden bays on the Atlantic side of Caldey Island. Two highly qualified and experienced local guides share an in depth knowledge of the island’s wildlife and surrounding waters. Ocean side of the island we drift amongst the Grey Seal population. Caldey Islands Cruise - 1 1/4 hour passage taking in some of Pembrokeshire’s most dramatic offshore islands. Cruise Caldey Island sound to the famous smugglers caverns before crossing to the protected bird reserve of St. Margarets Island. The Imposing Cathedral Caverns loom in the distance, towering over the boat as she draws closer. At the base of these caverns you can view thousands of resident and visiting birds including puffins, razorbills, cormorants and gannets. Sunset Cruise – July/ August. A 2 hour round trip passage down the coast and into the Atlantic Ocean to watch the sunset with a sundowner of your choice.